Demolition Exeter: "Exeter is the Jewel of the West, and We Have Destroyed It"
So boasted German radio the day after the city was attacked by bombers in the early hours of 4 May 1942. In many ways the statement was entirely accurate as, despite the demolition of so much in the 1930s, the attack of 1942 initiated a process of destruction that wasn't halted until the late 1970s, a period during which Exeter lost vast amounts of its historic architecture. The image left © Express & Echo, shows ruins in Catherine Street. Exeter was targeted in 1942 for a number of reasons. It was completely undefended, and it was within easy reach of German bombers crossing the English Channel from Northern France, and the RAF had recently destroyed much of the ancient Hanseatic German port of Lübeck. 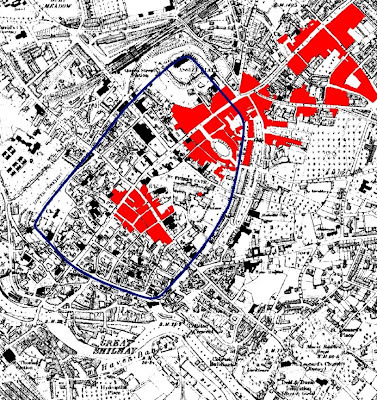 But Exeter was targeted primarily because of the rich historic fabric of its compact city centre. It was regarded as one of the most picturesque cities in southern England, although one which was in danger of spoiling itself through insensitive redevelopment. Much had been demolished by the local authority between 1900 and 1942, a period which saw many of the city's oldest timber-framed buildings destroyed during slum clearances, but much remained, built up over centuries on the old medieval street plan. 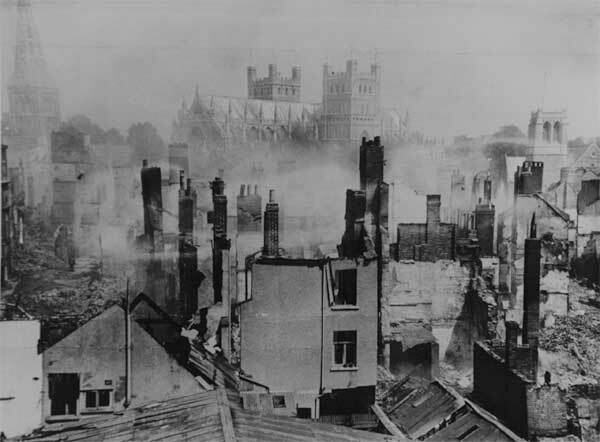 In the words of Sir Nikolaus Pevsner: "the German bombers found Exeter primarily a medieval city, they left it primarily a Georgian and early-Victorian city". The city had an 11th century castle; a medieval Guildhall; the finest Decorated Gothic cathedral in England; beautiful terraces of late-18th century and Regency domestic architecture; a large number of surviving medieval and post-medieval stone and timber-framed housing, including almshouses, churches, townhouses and inns, a number of which contained interiors of great historical and aesthetic value; there were 19th century public buildings, including two important neo-Classical market halls and a neo-Gothic museum; and a city wall which encircled Exeter almost completely. In 1942 the city was a product of nearly 2000 years of urban evolution, much of its street plan dating back either to the Romans or the late-Saxons, a maze of alleyways, lanes and courts, all densely filled with buildings that were completely unique to the city. The image above right © Express & Echo, shows firefighters near St Stephen's in the High Street. The image below left © Express & Echo, is the view over Catherine Street and Bedford Circus after the clearance of all war-damaged property. Exeter had been bombed 18 times prior to 04 May 1942, the first being in August 1940. These earlier raids were relatively mild and little damage was done, although there were a number of casualties. They were the product of German aircraft dropping surplus bombs over the city on the way back to base having targeted major industrial sites much further north of Exeter. Lübeck was bombed on 28th and 29th March, and the first retaliatory attack on Exeter, the first of the so-called Baedeker cultural targets, seems to have began on 23rd and 24th April. Only seven high explosive bombs were dropped, killing five civilians but inflicting relatively little material damage. The following night the bombers returned and 65 high explosive bombs were dropped, most of which fell in the residential area of Pennsylvannia causing extensive damage and killing 73. In his book 'The Three-Star Blitz', Charles Whiting made the extraordinary claim that following the bombing raid in late April some of Exeter's citizens, believing that the Cathedral served as both a guide and a target, advocated dynamiting the Cathedral itself to deter further attacks. 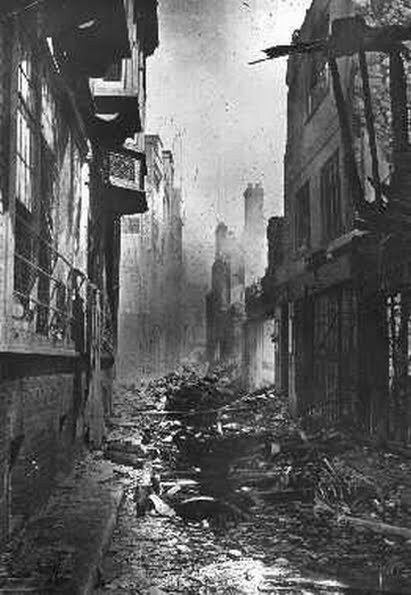 The focus of the Baedeker raids then turned to Bath, Norwich and York, but the bombers returned to Exeter in May, the city was blitzed and the destruction this time was immense. The image right © Express & Echo shows the destroyed chapel of St James in Exeter Cathedral. If the pillars supporting the clerestory windows had failed then the entire stone-vaulted roof over the choir would've collapsed. In the early hours of 4 May 1942 Junker Ju 88 bombers crossed the English Channel and followed the river Exe from the coast until they reached Exeter, dropping hundreds of flares to illuminate the city. The first incendiaries fell at around 1.50am in the area known as Newtown, near the medieval suburb of St Sidwell. The Exeter Blitz lasted for 1 hour and 20 minutes, during the course of which 10,000 incendiaries and 75 tons of high explosive bombs were dropped on the undefended city. Within 30 minutes nearly 70 separate fires raged uncontrolled throughout Exeter. The high explosives demolished buildings immediately, blocking streets and making any attempt to fight the fires caused by the incendiaries impossible, and a strong wind fanned the flames into a firestorm. Huge swathes of the city simply burned despite the efforts of the city's firefighters. The German aircraft allegedly machine-gunned anyone they saw in the streets below. Over 156 civilians were killed with nearly 600 more injured. 1500 buildings were destroyed and 2700 were seriously damaged. Over 16000 houses suffered moderate-to-severe damage. 9 churches were destroyed or seriously damaged, along with 26 inns, 400 shops, 6 banks, 150 offices and 50 warehouses. 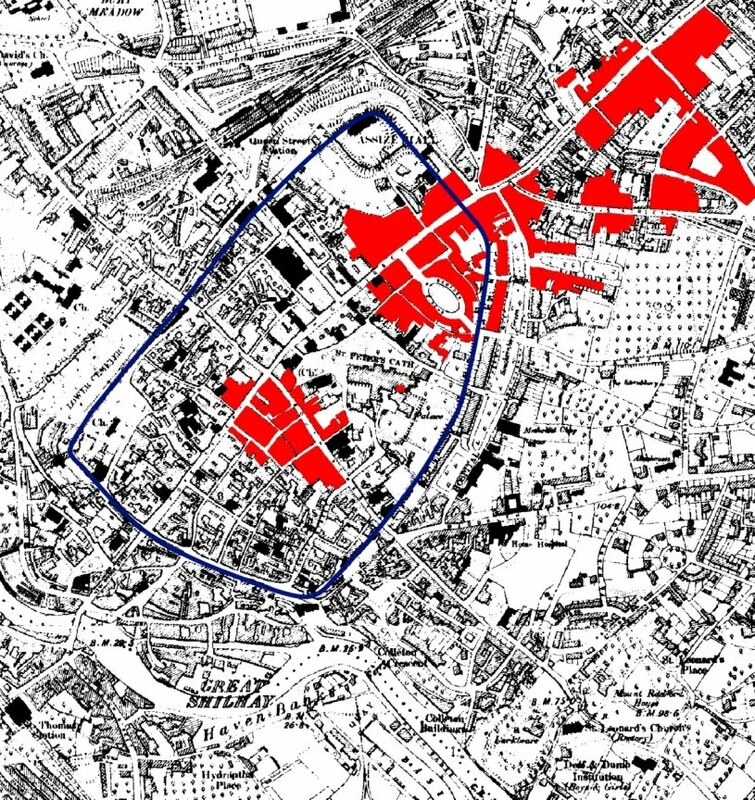 The map above left illustrates those portions of the city directly affected by the raid of 4 May 1942, the city wall highlighted in blue. The damage actually extended beyond the edge of the map, towards the north-east. It is interesting to compare this map with the one shown here depicting the extent of the destruction in Exeter over the course of the 20th century as a whole. The architectural casualties included the Lower Market, Bedford Circus, Southernhay West, Dix's Field, Paragon House, the Hall of the Vicars Choral, St Catherine's Almshouses, the Country House Inn, the New Inn, the medieval church of St Lawrence, the Eastgate Arcade, Bampfylde House, the Abbots' Lodge, the Choristers' School, the Regency Subscription Rooms, Higher Summerlands, Deller's Cafe, the 'Norman House', the Chevalier Inn, the Globe Hotel, the former townhouse of the Earls of Morley, Nos. 226 & 227 on the High Street, the West of England Insurance building, and large areas of the West Quarter, Catherine Street, Sidwell Street, Paris Street, South Street and the High Street. Incredibly, the Cathedral itself survived. The interior contained the longest unbroken medieval Gothic vaulting anywhere in the world and yet the only significant damage was caused when a high-explosive bomb destroyed the side chapel of St James in the south aisle of the choir. If the Luftwaffe were aiming for the Cathedral then they failed spectacularly. The two transept towers still stood over the city as they had done for 800 years, and as they still do today. 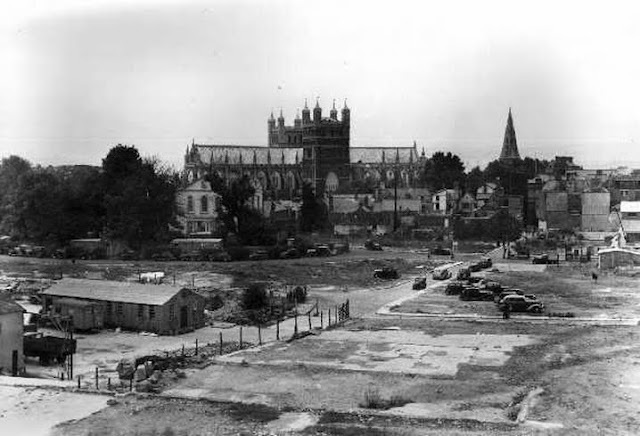 The 'jewel' of Exeter always has been the Cathedral and although the Nazis vowed to return to complete their aim, the raid of 4 May proved to be the last time German bombs fell on the city. The image above © Express & Echo, shows the view towards the Cathedral across South Street from the area of the Lower Market. The steeple of St Mary Major is just visible through the smoke on the far left. The tower of the Catholic Sacred Heart church in South Street is on the far right. 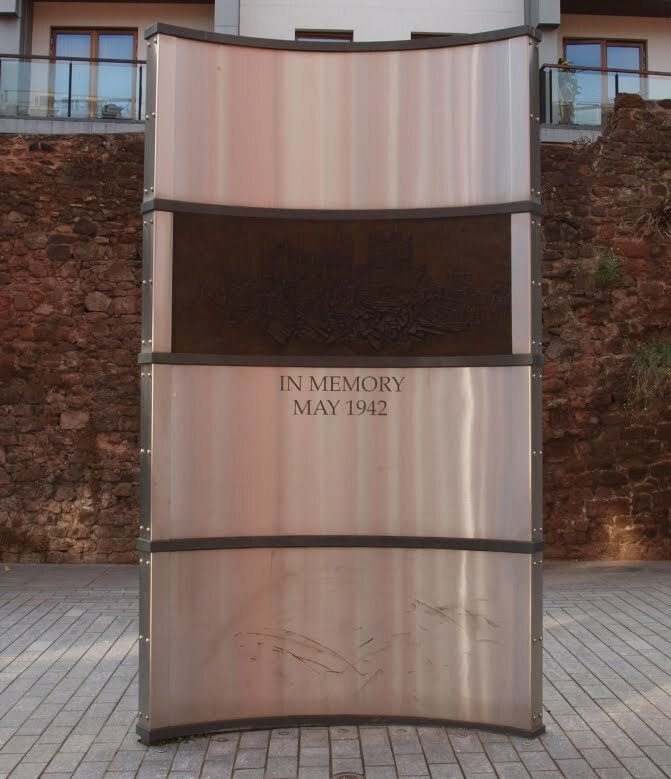 There is no question that the Exeter Blitz of May 1942 was a total calamity for the city. Thomas Sharp, the city's post-war town planner, believed that the Blitz of 1942 destroyed up to 50% of Exeter's historic buildings. He also offered the opinion that "Exeter was not wholly a jewel. And the Germans did not wholly destroy it". It is too easy to buy into the much-circulated myth that Exeter was 'destroyed' by German bombs. The reality is rather more complex. What was once the historic core of Exeter now can't even lay claim to being Georgian or early-Victorian. It is resolutely a product of the 20th century. Slum clearances, wartime bombing, local authority indifference, post-war rebuilding and the post-war redevelopment of many areas unaffected by 1942 all play a part in explaining Exeter's largely dismal 21st century appearance. As Gavin Stamp states in his book 'Britain's Lost Cities': "The Cathedral remains glorious, but the city is certainly no longer a jewel". Excellent, thanks, will link to this. I'm gutted. What was the council doing when all these historic buildings fell victim to urban redevelopment? From the rather good 'The Secret history of our streets' on BBC2 last night - a strangely familiar tale! Class was at the heart of The Secret History of Our Streets, a dispiriting tale of how town planners transformed a happy, booming south London community into a wretched one. Poor Deptford. And yet on Charles Booth's social map of 1899, its high street bore the rating of "middle class and well-to-do": grainy pictures showed aproned traders standing outside shops piled with wares, hung with geese and aglow with wellbeing – the Oxford Street of south London. Now look at it, with its tragic, fluttering stalls and cider drinkers and filth and betting shops and Costcutter. Older traders and residents remembered the post-austerity years after the war when they'd never had it so good – crowds in the market, owner-occupiers, spotless streets, polished doorsteps, curtains at the window, self-respect. What went wrong? Cut to the council offices of the late 1950s, and bow-tied men with toothbrush moustaches and drawing boards and anglepoise lamps, their voices grave as they exhorted efficiency and logic and sharper pencils. The city must be a machine, they cried, rationalised and re-engineered in glass and steel and concrete! Armies of environmental health inspectors declared war on the old slums with compulsory purchase orders, their miserable stigmatised occupants bulldozed off to remote soulless estates to die of loneliness and boredom. Walls fell to the sound of Jimi Hendrix, high-rises sprang up that no one wanted to live in. It was a familiar story. How odd, though (wondered the makers of this excellent programme), that the same Victorian and Georgian houses deemed fit only for demolition here and in London's other industrial communities were found to be so perfectly sound and dandy in the likes of Chelsea and Kensington (and, indeed, change hands for millions of pounds today)? The answer – recently unearthed from the council archives – was that the Deptford houses (or at least the ones they looked at) weren't condemned by inspectors at all. "No disrepair," said one report. "No damp. Just needs improvements." So what was the agenda behind this duplicity? A blind zeal for European modernism? Arterial roads? A dislike of Deptford? Whatever the grand experiment, sticky facts were swept under the carpet. In a week in which Britain has been encouraged to look upon this era with reverence and flag-waving, you could only think this wasn't our finest hour. The historical significance of some of the old houses in the West Quarter was fully understood in the 1930s even as plans were being laid to demolish them. It was suggested that some of the better ones could be retained and refurbished, acting as a draw for tourists coming to the city. Unfortunately nothing came of the plan and nearly all of the most picturesque properties were destroyed along with nearly everything else which predated the 19th century. Exeter was bombed in 1942 not for a " variety of reasons" but as retaliation for the British policy of area bombing. In March 1942 Harris targeted the town of Lubeck a town with no military value but one with plenty of medieval houses which would burn nicely. From Wiki "Although a port, Lübeck was mainly a cultural centre and only lightly defended. The bombing on 28 March 1942 was the first major success for RAF Bomber Command against a German city, and followed the Area bombing directive issued to the RAF on 14 February 1942 which authorized the targeting of civilian areas." War breeds hatred and repeating war time propaganda shows ignorance. I do actually cover the bombing of Lubeck in March 1942 in another post and provide a link to it. In that post I make it quite plain that the bombing of Exeter was a direct consequence of the bombing of Lubeck. I don't think anything in either post could be accused of "repeating war time propaganda". If everything was as clear-cut as you suggest then there would be no on-going debate concerning the morality of the Allied strategic bombing campaign, when there clearly IS. What I find puzzling is that given the distance the German bombers had to travel(compared to flying over the SE of England from Calais) fighter command were not able to intercept them . Radar would have picked them up flying over the much wider western end of the channel giving the air defences much more time than happened during the Battle of Britain. Any ideas? 1) You've got to allow for the limited effective range of radar at the time. 2) Improvements and developments in radar performance as technology improved were prioritised to the areas of greatest risk ~ which was not perceived as being the South West of England. 3) Selection of the targets attacked by the Luftwaffe would have considered the strength of the defences. 4) Occupied Brittany to Exeter was only 100 miles as the crow flies over the Channel ~ and the approach is almost perpendicular to the coast. They weren't flying along the coast from Calais ~ which have been much more risky because of the concentration of detection and defensive capability. Firstly, my highest respect for this impressing blog and the incredibly detailed knowledge displayed. My aunt used to live in Exeter for several years there with husband and kids, and my parents return there almost annually for vacation. Fortunately the ridiculous but sad Baedeker blitz didn't manage to destroy nearly as much as intended. My hometown Bremen has a similar story to tell - a lot of medieval buildings were in fact already torn down in the 19th century, well before the British area bombings of WWII, which nevertheless wrecked havoc to many non-strategic parts of the city - not to mention countless other historic German city centres. I still feel resentful towards Britain (in a fuzzy sense) from time to time for the unparalleled area bombing and the subsequent loss of heritage during WWII. Stupid Germans really, showed the Brits how it's done in Coventry. I haven't entirely bought into the common narrative of the British area bombing being without alternative back then, though. The United States thought differently, as we know. It's a shame Harris got his own statue, unveiled by no less a figure than the Queen herself.